What’s better than mashed potatoes? Mashed potatoes with broccoli and cheddar cheese! Our kitchen vocabulary word of the week is mash. When we mash, we make our food smaller and softer. 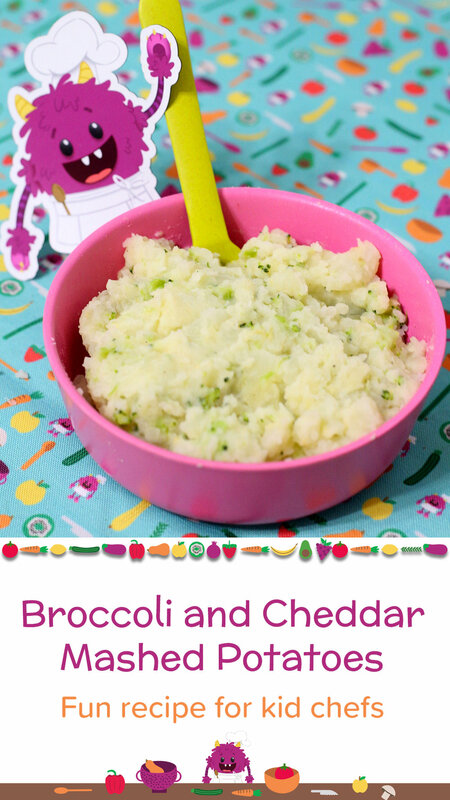 These broccoli and cheddar mashed potatoes make a perfect side dish to any meal, or a fun snack! 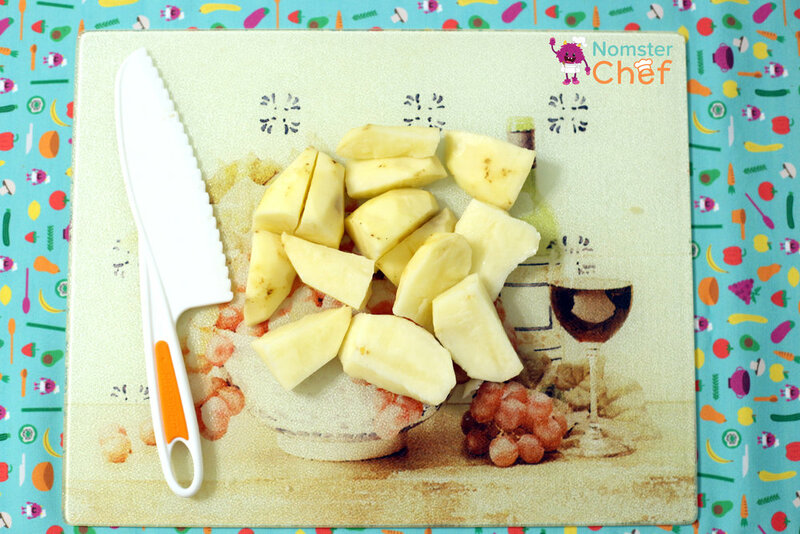 Peel potatoes with vegetable peeler. Once peeled, quarter the potatoes. To quarter means to cut into four equal pieces. 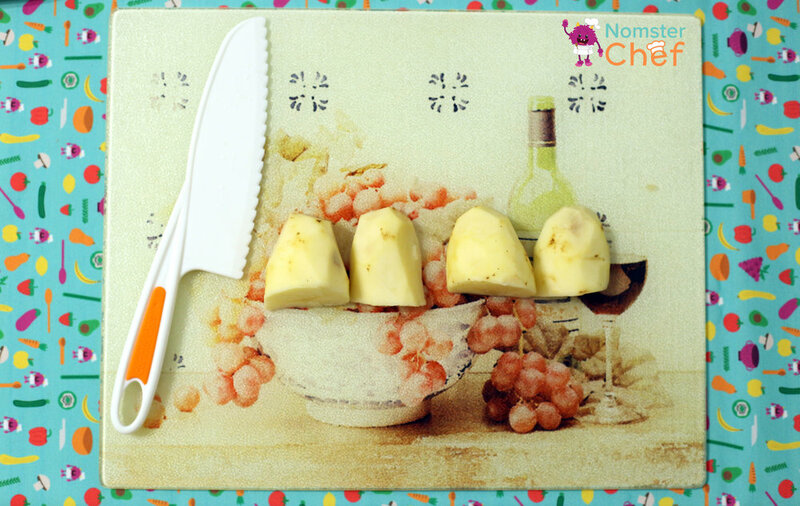 Use the kid chef knife to cut the potato in half, then cut each half in half. Repeat for each potato. Get your medium saucepan and place the peeled potatoes in the saucepan. Using a liquid measuring cup, add 4 cups of water to the pot. Put a pinch of salt in the pot. A pinch means the amount of salt you can hold between your thumb and pointer finger. **Grown-up** Set saucepan on stovetop, set the heat to high, and bring potatoes to a boil. Kid chef, set a timer for 15 minutes. **Grown-up** The potatoes are done when they are tender enough to be poked with a fork. Take the broccoli out of the freezer and read the directions on the package. Place the bag in microwave. Set the microwave timer according to the directions on the bag and press start. Time for the cheese! 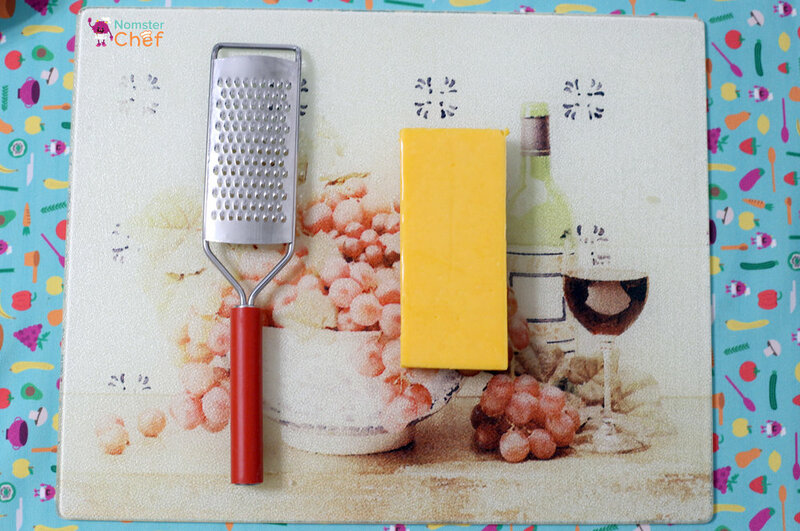 Unwrap the block of cheese and take out the microplane or box cheese grater. Using the cheese grater, shred the cheese. Keep going until you can fill a quarter cup measure. Set aside the cheese for later. Get out the frying pan. Measure 1 tablespoon of butter. Put butter into frying pan. Measure 1 cup of milk. Put milk into frying pan. **Grown-up** Put frying pan on the stove until butter is melted. **Grown-up** Once the broccoli is done, remove from the microwave and pour into medium sized bowl. Kid chef, once the broccoli is cool enough to touch, measure 1/2 cup of broccoli. Using the kid friendly knife, cut the broccoli into smaller pieces. **Grown-up** Once the potatoes are tender, drain in a strainer and place in bowl. To mash potatoes with a fork, press the flat part of the fork down onto the potato until it is in smaller pieces. Mash all of the potatoes. It might be easier to take the potatoes out of the bowl onto a plate for mashing. Transfer the mashed potatoes back into the pot. Pour milk and butter mixture into the mashed potatoes. 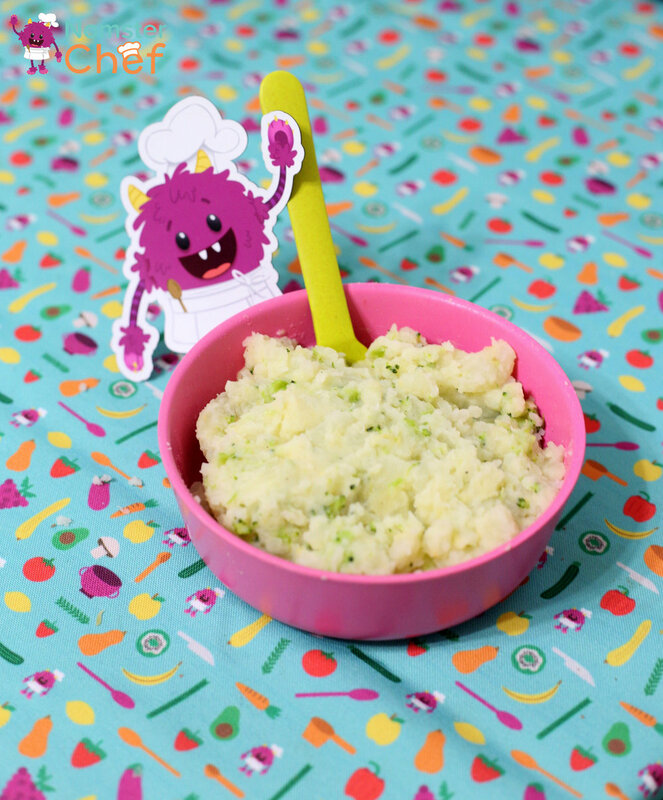 Add cheese and broccoli to the mashed potatoes! Add salt and pepper to taste. To taste means to your liking, kid chef! Put your delicious broccoli and cheddar mashed potatoes into a bowl for serving!